After the conclusion of Conference to promote Vietnamese Literature to the world in the evening of March 7, 2015, member of the Poetry Council of the Association of Vietnamese Writers Nguyen Quang Thieu invited some foreign poets from the United States of America, Cuba and Colombia who are old friends to pay a visit to some friends in the group of patriotic personalities of Ha Dong including Mr. Le Phuong Chung – Director of Ngoc Viet Paper Industry Joint Stock Company; Mr. Do Van Hieu, Director of Phuc Hung Traditional Pharmaceutical Co.,Ltd; Mr. Trinh Van Sy, Deputy Head of Ha Noi Traffic Police Department; Director and Poet Luong Tu Duc; Meritorious Artist Chu Luong, Director of Thang Long Water Puppet Theatre; and Painter Hoang A Sang. Among them, Mr. Do Van Hieu had introduced to foreign poets about Vietnamese traditional medicine based on medicinal herbs being familiar with Vietnamese people for the past thousand years. On the occasion, they had had a chance to enjoy Syzygium nervosum’s leaf water and liquor made from a Northern kind of large-size –grained glutinous rice produced by the Phuc Hung Traditional Pharmaceutical Co.,Ltd being laid down from 15 to 18 years. Syzygium nervosum’s flower bud and this kind of liquor were given to each poet from the United States, Cuba and Colombia after they left Vietnam. In addition, Mr. Le Phuong Chung and his family opened a banquet for the guests to introduce beef Pho (Vietnamese Noodle Soup) Recipe. As for writer Nguyen Quang Thieu, the Pho’s cooking skills of his family is the best in Ha Noi and they just serve this special food on special occasion. An initiative had been posed in a cozy night in Mr. Le Phuong Chung’s house, located in My Duc District, Ha Noi where poets from Vietnam, Cuba, The United States of America and Colombia wrote a letter for sending to Presidents Barack Obama and Raul Castro. The letter aimed to endorse and encourage the lifting of barriers and the opening of doors to cooperation and culture exchange between the US and Cuba. The poets from Vietnam, US, Cuba and Colombia have different reasons to write the letter as people from these countries had to go through the war… but they had eased the hostile as Vietnam and the US. As this reason, the American poets wanted to share publicly that this letter written in Hanoi – a peace capital in the year marking 20 years of normalized relations, progressive and multifaceted progress in bilateral relations. The poets of Vietnam and America in this evening were witnesses of the history of relations between the two countries. When politicians and diplomats of Vietnam and the United States could not come together, shake hands, bless each other, the poets and writers of the two countries had done it. Professor of language, poet Martha Collins, who translated poetry of many Vietnamese poets into English and published in the US, was chosen as a letter writer. Mr. Phuong Chung gave the staff to open the store and select a premium roll of paper type for poets to write in it. Everyone agreed to write a very short, simple letter. Then, the letter would be sent to artists, intellectuals and peace lovers around the world for autographs. In that a moment, poet Nguyen Quang Thieu realized that even though they were famous professors and poets, the opening words of that letter were not easy. It was not difficult due to words but it was hard because of the emotion and spirituality at that time. Something touching and sacred is filling the house. He realized it was poetry with all its meaning. True poets never have borders. It surpasses all hatred. It breaks the ridiculous borders and inhumane barriers so that the people could come together at the highest respect, in the most sincere love and in the intense general aspirations of this world. The letter was short, concise and simple but it contained the greatest aspiration for peace, friendship and fairness. About 9:30 pm in the evening of March 7, 2015, the letter was composed in English. Poet Nguyen Ba Chung translated the letter into Vietnamese; and Poet, translator Pham Long translated the letter into Spanish for two Spanish poets Fernando Rendón (Colombia) and poet Alex Pauside (Cuba) to hear and comment and standardize the Spanish version. 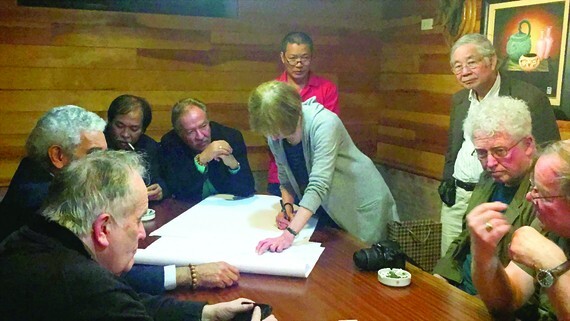 By 10pm, the first poets signing the letter were Fernando Rendón, Martha Collin, Alex Paudise, Kevin Bowen, Lary Heineman, Nguyen Ba Chung, Luong Tu Duc, Fred Marchant and Nguyen Quang Thieu. This letter will be translated into several other languages and will be sent to poets, writers, intellectuals and peace lovers around the world. If each person who receives this letter agrees to sign the favor, they will transfer it to others. And Mr. Nguyen Quang Thieu thought that even though this letter deals with the normalization of relations between the United States and Cuba, it brings the common message of peace, friendship and justice to every human being, every nation in the world. After the poets, the compilers signed the letter, the first signatories of the letter were family members of Le Phuong Chung, businessman Do Van Hieu, senior lieutenant colonel Trinh Van Sy, water puppet artist Chu Luong, translator Pham Long Quan. A letter to Presidents Barack Obama and Raúl Castro. Martha Collins, U.S.A; Alex Pausides, Cuba; Nguyen Quang Thieu, Vietnam; Fernando Rendón, Colombia; Fred Marchant, USA; Larry Heinemann, USA; Luong Tu Duc, Vietnam; Kevin Bowen, USA; Robert Scanlan, USA; Nguyen Ba Chung, USA signed. On March 17, 2015, the poet Kevin Bowen on behalf of the drafters of the letter and the signatory sent this letter to President Barack Obama with the list of the supporter signers after returning from the United States. In his letter, the poet Kevin wrote: “We hope you will put this letter in your heart and provide support for the exchange activities”. Eight months later, President Barack Obama sent a letter to the poet Kevin. Thank you for writing to me, the best way to improve the nation's interests and values is through openness rather than isolation. That is why, after half a century, the United States is changing its relationship with the Cuban people and is moving towards normalizing relations between the two nations. Decades of isolation policy have failed to make meaningful change, and by implementing a new program, my government reaffirmed its commitment to promoting the emergence of a more prosperous Cuba which is respecting the universal right of all citizens of this country. To achieve that, the United States is taking steps to enhance tourism, trade and information exchange with Cuba. We also established diplomatic relations with the Cuban government, including the opening of the US Embassy in Havana on July 20, 2015. No one is more representative of American values than Americans and I believe that this connection will ultimately serve to empower our Cuban neighbors. The table of Mr. Le Phuong Chung's family in Chuong My, Hanoi, where the poets having the special relationships in the history. They composed a letter to the President of the United States was moved to Trinh Van Sy’s house in Da Sy village, Ha Dong, Ha Noi for a special reason. That was when the poets were drafting the letter, the second grandson of Sy was born. The poet wrote his blessing on the wooden table. Now, Trinh Van Sy engraves names of the people wrote letters in the two sides of the table. In 2017, poet Kevin Bowen, poet Nguyen Ba Chung and some other American poets returned to Vietnam. They came to visit Trinh Van Sy's family and again sat at the wooden table, saying good things about people and culture.